So, you think you’d like to sing with the Oregon Chorale? Great! All that’s required is musicality, dedication, commitment, and a sense of adventure. Auditions are informal and consist of opportunities for you to demonstrate your sense of pitch, reading abilities, and vocal technique. A great solo voice is not required. 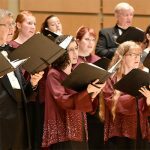 We are primarily a choir, and while solo opportunities arise from time to time, the emphasis is placed on each musician’s ability to blend and contribute to a unified sound. Many of the Chorale’s current members have been with the group since its inception in 1985. Because of this high level of retention, openings are generally limited. Tenors and basses: If you would like to be considered for an open position, please send us an email by clicking the link below. Please include your name, phone number, part you sing, something about your musical experience, and how we may contact you. Auditions will be held before the first Chorale rehearsal of every concert season (at Century High School) in September, January and March. At this time we are not auditioning sopranos and altos. Thank you for your interest! Please fill out the form below to contact us. Please tell us a bit about yourself and your experience.